Protein arrays make possible the detection and quantitation of many proteins simultaneously, thus enabling researchers to ask fundamental questions about biological processes and to discover biomarkers that can be used diagnostically. 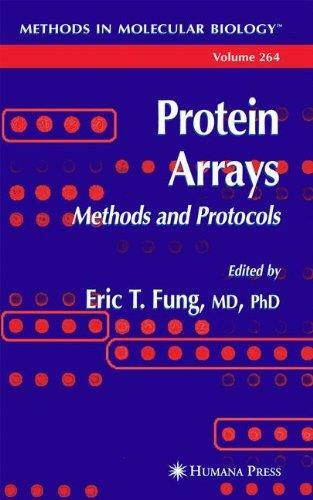 In Protein Arrays: Methods and Protocols, innovative experimentalists describe in detail the methods they have developed to synthesize and construct protein arrays for basic and clinical research. The authors present protocols to create and immobilize the capture substrate-the first task in designing a protein array-using a variety of affinity capture reagents, including antibodies, peptides, aptamers, biotin, chemical reagents, and chromatographic substrates. Once synthesized, these arrays can be used to analyze protein-protein interactions and posttranslational modifications, such as phosphorylation, as well as to discover and characterize potential diagnostic markers. Protocols to accomplish these tasks are also presented. The protocols presented follow the successful Methods in Molecular Biology™ series format, each one offering step-by-step laboratory instructions, an introduction outlining the principle behind the technique, lists of equipment and reagents, and tips on troubleshooting and avoiding known pitfalls. 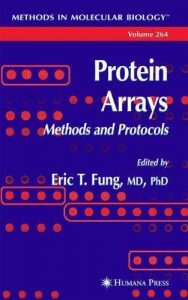 Diverse and highly practical, Protein Arrays: Methods and Protocols offers basic and clinical investigators a broad spectrum of approaches to the generation of protein arrays, as well as their uses in biomarkers discovery, in assay development, in clinical sample testing, in signal transduction analysis and characterization, and for creating the next generation of molecular tools.